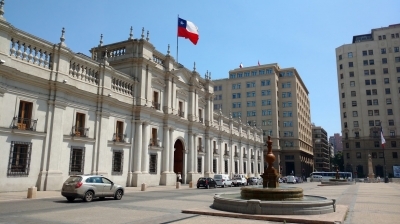 La Moneda Palace is part of the Tentative list of Chile in order to qualify for inclusion in the World Heritage List. On my first day in Chile I decided to tick off all TWHS in the town center while at the same time getting a grip on my jet lag. The La Moneda Palace and the San Francisco Church and Covent are both 1-2 blocks apart in downtown Santiago de Chile and can be combined into a leisurely visit of the city. The Spanish had several mints in South America. The most famous one was the one in Potosi. Most dated from the 16th century. In 1750 a mint opened in Santiago. Eventually a new mint was constructed: the La Moneda Palace. After Chilean Independence it continued to serve its function as mint (1814-1829) and eventually was turned into the seat of the president (1845). It is to this day the seat of the president. [D]eemed by some specialists the best and most harmonious civilian building of the Colonial America. Some "specialists" without a reference... Good to know. The Palace may be a symbol of national pride and history, but it does not belong on the list. Well, if I was to do my Chile trip all over again, I would cut Santiago short and head from the airport to Valparaiso on the cost. Santiago is popular with backpackers but there is very little to do and see. Originally I had planned (and paid for) a day trip to Sewell, but the trip got cancelled due to weather. I spent the day rafting on the Maipo river.